ULA Atlas V Launches Orbital ATK CRS-6 Mission to the International Space Station. A United Launch Alliance Atlas V rocket lifts off from Space Launch Complex 41 at Cape Canaveral Air Force Station. 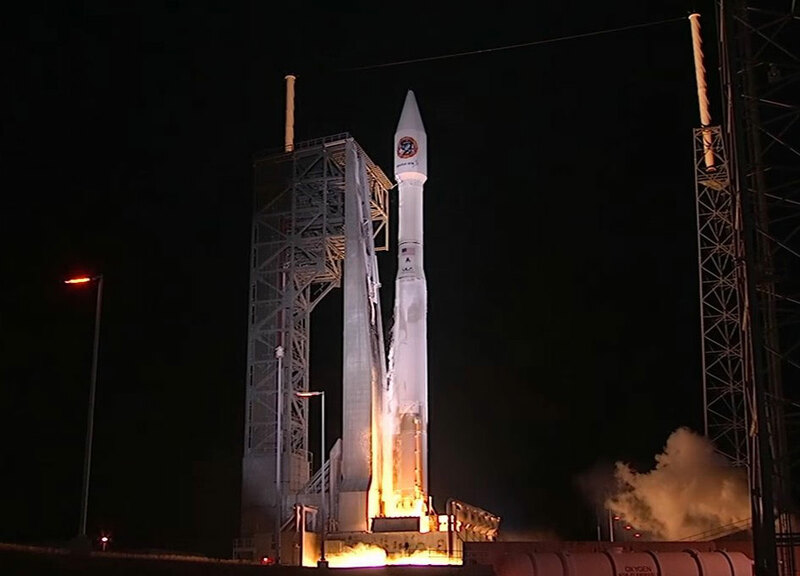 Liftoff was at 11:05 p.m. EDT. The Orbital ATK CRS-6 Cygnus spacecraft on a commercial resupply services mission to deliver 7,500 pounds of supplies to the International Space Station. Approximately 21 minutes later, the spacecraft successfully separated from the Centaur upper stage at its initial orbit, where it will rendezvous with the ISS. The mission was flown for Orbital ATK under NASA's Commercial Resupply Services contract, and, with a payload of more than 16,000 pounds, was the heaviest payload to launch on an Atlas V to date. "ULA is honored to be a part of the team that delivered more than 7,700 pounds of cargo to the astronauts aboard the ISS and CubeSats to be deployed after Cygnus separates from the ISS," said Gary Wentz, ULA vice president, Human Launch Services. "Congratulations to our mission partners at Orbital ATK and NASA on another successful launch that will help advance our scientific knowledge on Earth and in space, and inspire the next generation of space explorers." This mission was launched aboard an Atlas V Evolved Expendable Launch Vehicle (EELV) 401 configuration vehicle, which includes a 4-meter-diameter extra extended payload fairing. The Atlas booster for this mission was powered by the RD AMROSS RD-180 engine and the Centaur upper stage was powered by the Aerojet Rocketdyne RL10C-1 engine. It was the ULA's third launch in 2016 and the 106th launch since the company formed in 2006. "I am also extremely proud of our engineering and mission integration teams as this vehicle flew the first flight of the upgraded boattail," Wentz said. "With every launch, we build upon our years of experience and continue to find new and better ways to launch our customers' payloads to orbit in an efficient and cost-effective manner." ULA's next launch is the MUOS-5 satellite for the U.S. Navy, scheduled for May 5 from Space Launch Complex-41 from Cape Canaveral Air Force Station, Fla.